Quiet and Stable — Adopting an optimized motor with unique noise reduction, it’s super quiet for a mini fan. 3 rubber cushions at the bottom keep the fan in its place while working. Broad Compatibility — Powered by a 1.2 meter USB cable, it works with laptops, computers, power banks and other USB-enabled devices. 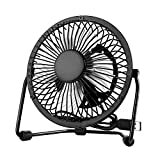 Adjustable Angle — The fan is able to swivel forward and backward. Just adjust the angle to suit your position freely. Reliable Quality — Metal frame holds tightly around. Aluminum blades are lightweight yet more durable than others, and it won’t deform over time yet cost less energy. Cools Your Summer — At a portable size, it brings you a right amount of breeze that cools your summer. Quiet and effective cooling in summer. With a noise-reduction motor and lightweight blades, the fan produces the right amount of breeze, with an acceptable noise that won’t affect your work or rest. Built-in power switch makes it simple to operate. Or you can just plug and remove the USB cable. Compatible with computers, laptops, power banks, multi-ports chargers and more. Its understated looks and portable size blend well with your desk, and also fits bedrooms, dining rooms and more. With suitable size, it’s super portable to go wherever you go, as long as there are available USB ports. Metal frame holds snugly and won’t easily deform or be crushed. Aluminum blades work incredibly quiet for a desk mini fan, and produce a stronger air with less energy cost. The bottom rack with 3 rubber cushions keeps the fan in its place. Desktop LED lamp that is pleasant on the eyes with flicker-free lighting for reading, working, and studying, creating warm and soft atmosphere. USB ports with built-in smart IC chip that automatically detects your devices and offers efficient charging for 2 devices(support for iPad Pro 9.7″/12.9″, iPhone SE/6s/6s Plus, Samsung Galaxy S7 and etc.) simultaneously. 5V / 3A Max(2.4A per port) charging output to ensure you receive full power and also 100% security. With over-voltage, over-charge and short circuit protection to ensure a safe charging experience. Economical and Environmentally Friendly: These power-saving LEDs last over 20 years, so you’ll never have to change a bulb again. Solid base with non-slip material ensures strong overall stability. 12-Months Warranty. This Desk Lamp comes with 12 months of worry-free warranty and 24/7 customer support. Just send us an email and we will make things right for you. Touch-sensitive control dimmable Lamp, just touch your finger to adjust stepless brightness ! Enjoy the ideal brightness setting whether you’re working in the office, studying, relaxing or getting ready to sleep. From boosting your productivity to unwinding faster, get the edge and don’t be left in the dark. The premium-grade diffusion panel minimizes eye fatigue and strain with flicker-free, non-ghosting light. The fully adjustable 90 degree adjustable tilting arm with both 180 degree vertical adjustable lamp head deliver the perfect viewing angle wherever you sit.